These days, the number and type of solutions for email marketing are numerous. An email marketing landscape has been created by Fluent to give insight into who’s who and especially, what. There are definitely a lot more companies out there of course in the field of email marketing, but the ones in this landscape are either market leaders in their field, or have substantial market share in that field. As you can see, there are several sections of email marketing-related companies. Main section or category is of course the ESPs, or Email Service Providers. Well-established names in this section are Silverpop, MailChimp, Bronto, Experian, Listrak as well as Sailthru, Acxiom, Constant Contact, Espilon, dotmailer and Yesmail. Last but not least, currently the biggest email marketing software providers in the industry: Salesforce Marketing Cloud (formerly ExactTarget) and Oracle Marketing Cloud (formerly Eloqua). Of course, ESPs are just one piece of the pie, even though it’s a big piece. Other sections include customer analytics (Agilone, Custora, Retention Science), real-time (Movable Ink, LiveIntent, PowerInbox etc) as well as MTAs (port25, Sendgrid, Amazon web services etc) and email agencies (Trendline Interactive, Inboxgroup, AlchemyWorx, Brightwave etc). For email marketing, having quality addresses and deliverability counts. In the validation-section we find FreshAddress, BriteVerify among others. In the deliverability-section there’s Email on Acid, Litmus (email testing companies) as well as Return Path and eDatasource. Of course, email marketing is great for acquisition: getting new leads and clients, but also for recommendations and remarketing. In the acquisition-section there’s Criteo, Prospectiv as well as Conversant. Fluent, the company that created the email marketing landscape, puts itself in the acquisition-section too. In recommendations / remarketing, we find Baynote, Richrelevance, Mybuys and Certona among others. 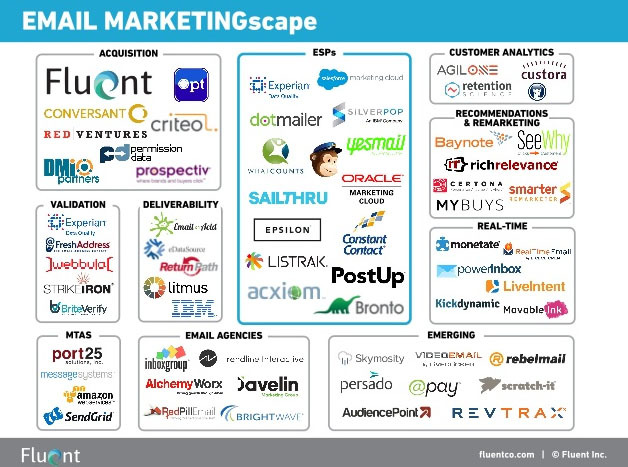 Lastly, there’s a section for emerging email marketing software and otherwise email marketing-related companies. These include Videomail (by Liveclicker), Rebelmail, Persado, Revtrax and Skymosity. Some companies may not be very well known to the outside world, but don’t forget that many of these companies are based in the USA, which is a big market for both consumer-oriented email marketing as well as business-oriented email marketing. Wow. Strongview doesn’t even get a nod in the emerging category? We’re in the process of evaluating ESPs, and their platform seems to go head to head with the big boys feature-wise. And are you including Responsys in the “Oracle” bubble? Because it’s a lot more of a true ESP than eloqua.